Brief History Legislation was promoted in 1890 for the licencing of both cats and dogs. A meeting was called by the Secretary of the National Cat Club for the purpose of reading the proposed legislation and for giving an official response from NCC members back to the legislators. Acquisition Purchased 2014, by John Smithson for The Harrison Weir Collection. National Cat Club - Notice of Meeting - to Mr Charles H. Lane. 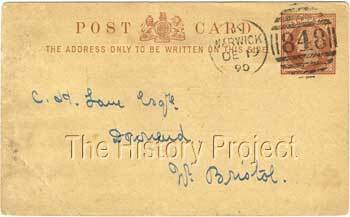 Postmarked December 19, 1890. In many respects, this small postcard is very indicative of the Victorian era, in that it is succinct and seeks to deal with an immediate issue of significance to cat fanciers in an efficient and prompt way. The issue, which was proposed legislation from the House, for the licencing of both dogs and cats, was, as you would expect, a topic which attracted a huge response from dog and cat owners and fanciers throughout the United Kingdom. It was invariably viewed as not only just another way for the Government to raise yet another tax, but also as an invasion of personal choice and as a slight on the 'services' provided by both dogs and cats, to society in general. The debate raged openly in the popular press of the day, who invariably lampooned the whole idea with mocking cartoons and images of dogs and cats in the service of mankind, as rescuers, and faithful ratters. 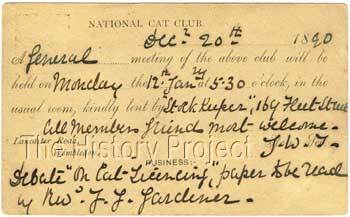 The card is signed by the then acting Secretary of the National Cat Club and notifies the recipient that the paper will be read by Mr. J. J. Gardner, who was himself, at one time, an acting Secretary of The National Cat Club. The addressee in this case, Mr. Charles H. Lane, was member of the Club and later served on the Committee. This is the same Charles Lane who was a prominent cat fancier; a cat, cavie, rabbit and dog judge; author of Dogs and Doggy People and Rabbits, Cats & Cavies, the latter of which he dedicated to Harrison Weir. Although small, this card is the earliest original official documentation in the collection sourced from the National Cat Club.